Soon after joining Op-Ed as art director, I set off an unseemly spectacle. An essay that accused Henry Kissinger of manifold war crimes was to run on Sunday. William Pfaff, International Herald Tribune columnist and influential foreign policy author, had written an authoritative text that called for bold art. Though I was a naïf from California, new to New York and the Times, I was acquainted with the work of David Levine, whose caustic caricatures in the New York Review of Books would, I thought, enhance Pfaff’s prose. Levine jumped at the chance to portray the famed statesman whom he despised. Levine´s drawing was a satiric masterpiece. 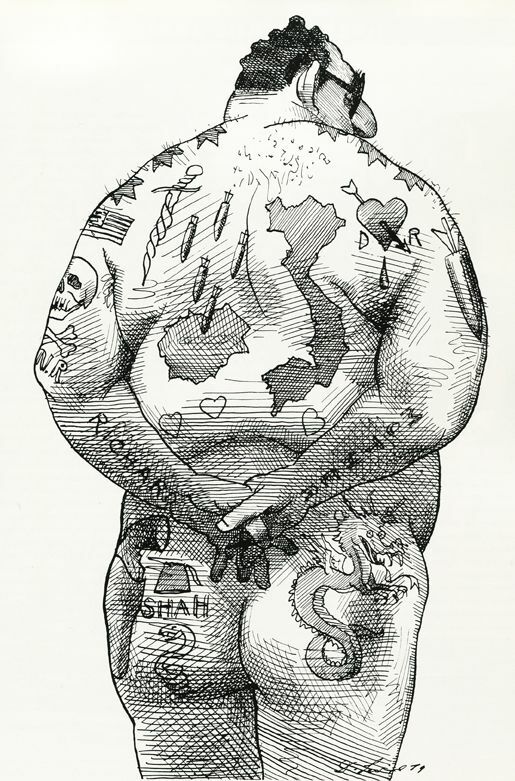 Tattooed on the diplomat’s back are the hallmarks of his career: Shoulder hairs become Arabic script, bombs fall on Cambodia, Vietnam darkens, and “Richard” shares forearm billing with “Mother.” Kissinger´s cheeks feature the Shah of Iran, a Chinese dragon, and a holstered gun. Glowing with pride, I presented the superb spoof to Charlotte Curtis (Op-Ed´s top editor and the person who hired me). Curtis turned up her nose. Curtis spun around in her chair. With withering finality, she announced, “It’s a cheap shot.” Having failed to meet Times standards, all I could do was apologize profusely to the artist. “Send it back,” was Levine´s icy reply. I returned his original and asked the Times bookkeeper to send him a check for the full price of publication instead of the usual 1/2 “kill” fee. Since no artist likes to see a beloved piece languish, it´s not surprising when an illustration that was rejected by one publication appears later in another. I strongly suspect that Levine´s elaborately tattooed Kissinger (delivered quickly after I called him) was first rejected by the New York Review of Books. In 1991, eleven years after the tattoo debacle, David Levine accepted a Times commission, thereby recanting his dire, “never ever” threat. By that time, after a decade as Op-Ed art director, I´d been fired by the fourth top editor I worked with, Les Gelb, who found me insubordinate. But he lacked the power to fire me from the paper; I simply switched to another section. Gelb, a heavy hitter who had come to the Times from the Department of Defense, would soon be fired altogether from the Times. A year after Gelb left, Op-Ed´s new editor asked me back. The person who art directed Op-Ed between my two stints also had the bright idea of commissioning David Levine. This time, it was published. The outrage that its publication unleashed tortured the Times more than has any other illustration. Looking at it now, it´s hard to understand how the editors could have let it go. But let it go they did. And on the morning of publication, Arab-Americans telephoned in droves. They were so mad and so many that the Times was forced to record an apology.